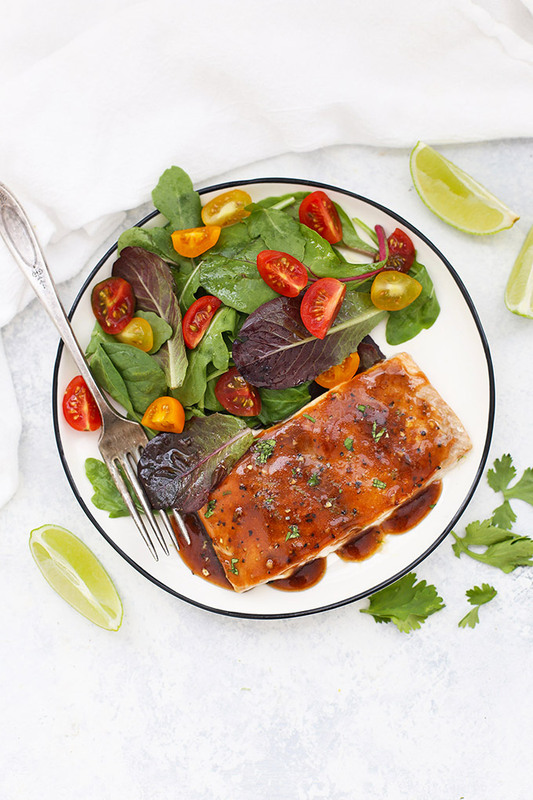 Balsamic Lime Salmon – This easy salmon recipe is bound to be a family favorite. 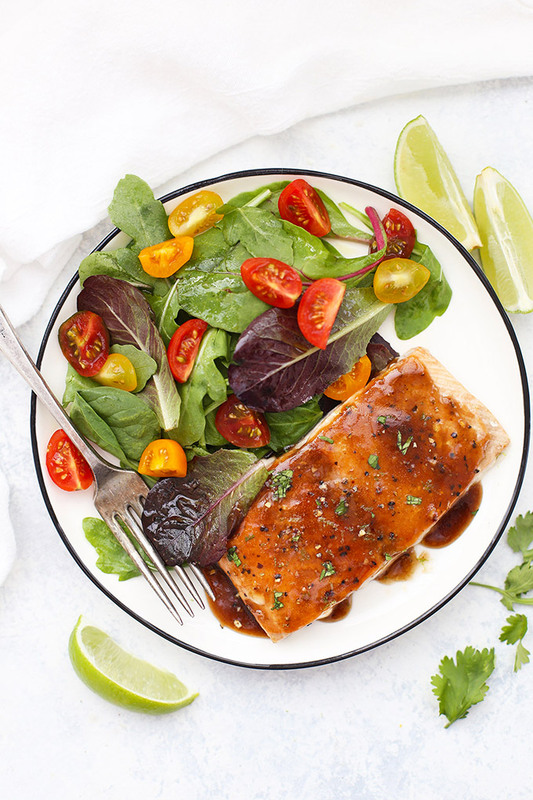 Simply cooked Alaska salmon and a bright balsamic lime glaze make this a weeknight staple! 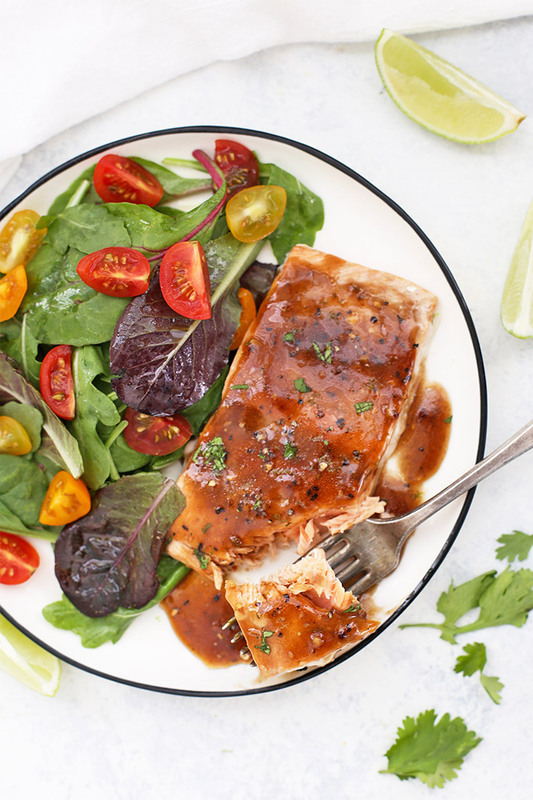 Today, we’re sharing an old favorite today: Balsamic Lime Salmon! 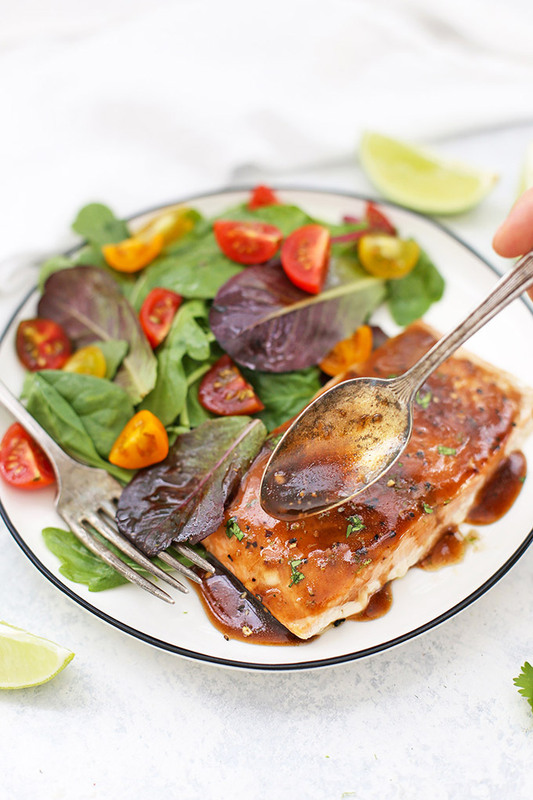 Simply cooked Alaska salmon and a bright balsamic lime glaze are SO good together. Plus, the preparation is so quick and easy, there’s no reason this shouldn’t be in your weeknight rotation! 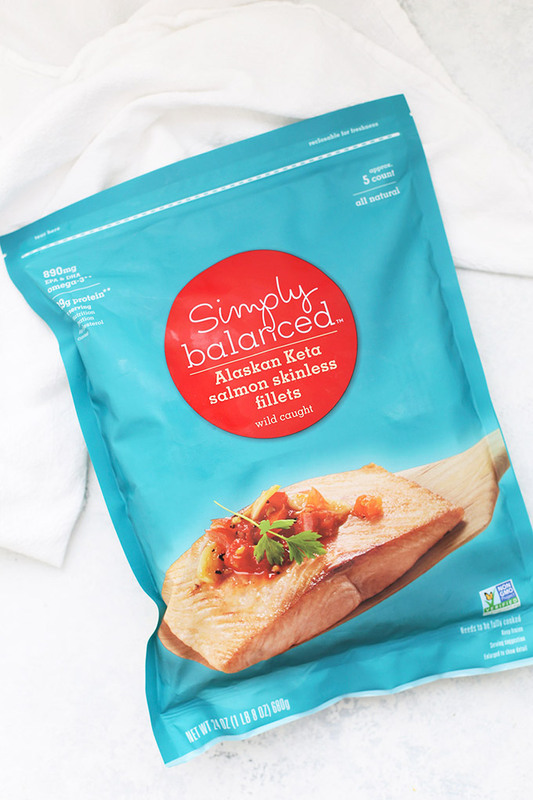 Alaska salmon season runs from June to September, but I love that I can also find Alaska salmon year-round in almost all my local grocery stores thanks to the availability of frozen fillets. There are 5 different varieties of Alaska salmon (king, sockeye, coho, keta, and pink), and I can find all of them frozen–even here in the desert! Today, I’m using keta fillets, though other varieties (like sockeye or pink) will work too. Keta is a great “beginner” salmon because of it’s mild flavor and firm texture. Convenience – I’m using frozen fillets, which I can have on hand for busy nights. Frozen fillets only take about 20-30 minutes to thaw in a bowl of water in the refrigerator. That means even when time is tight, I can still have this dinner on the table in no time. On top of that, our balsamic lime glaze is made from just a few ingredients you’ll likely have on hand! Simplicity – This is about as easy as it gets! 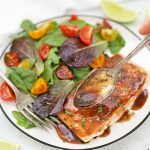 All you need to do is mix up your balsamic lime glaze, cook your salmon (it only takes 4-6 minutes! ), and brush it with the glaze. While the glaze and salmon cook, you can easily mix up a salad or cut up some fresh fruit to go on the side. The GLAZE – You know I’m all about a good sauce or marinade, and this balsamic lime glaze is SO GOOD. The balance of tangy and sweet is spot-on, and with a little salt and pepper, the flavors are beautifully well-rounded, and so complementary to the mild Alaska salmon. A little sweetness – Depending on how tart your lime juice is and how strong your vinegar is, you may find that you’d like a little more honey. Taste the glaze when it’s thickened, and add additional honey as needed. Similarly, you may find you’d like a little more salt or pepper. This is the perfect time to taste and adjust. Follow your taste buds! Too thick? If your glaze is thicker than you like (or stronger tasting than you like), you can add 1-2 Tbsp of water and whisk it in to thin it back out. Garnish – To garnish this, you can sprinkle it with a little fresh lime zest or some fresh cilantro. Not necessary, but definitely pretty! A trick for thawing salmon – My favorite way to thaw frozen salmon fillets is to place them (still in their wrapping) in a bowl of cold water in the refrigerator. They’ll only take about 30 minutes to thaw! Variations – I love this dish as it is, but if you’d like to add another layer of flavor, you can also add 1 clove of finely minced garlic or 1/2 tsp minced fresh ginger to your balsamic-lime glaze. Looking for more? Visit wildalaskaseafood.com for hundreds of Alaska Seafood recipes, cooking tips and techniques, information on their harvesting methods, and more in their Ultimate Guide to Wild Alaska Salmon. Prep your pan. Line a baking sheet with foil or parchment for easy clean-up. If not using foil or parchment (or, if using skin-on fillets), grease your pan with a little olive oil or nonstick spray to prevent sticking. Prepare your glaze, by combining lime juice, balsamic vinegar, honey, olive oil, salt, and pepper in a small saucepan. For thicker glaze (which I recommend), add the cornstarch or arrowroot powder. Whisk glaze ingredients over medium heat until the mixture thickens. You’ll know it’s thick enough when it coats the back of a spoon, or when you can clearly see the trail your whisk makes in the glaze. Taste for sweetness** and set aside. To prepare your Alaska salmon, place the salmon on your prepared baking sheet. Pat salmon dry with a paper towel or clean kitchen towel. Brush with a thin layer of olive oil (start with tsp and add more if needed). Sprinkle generously with salt and pepper. Roast in the oven for 4-6 minutes, or until your salmon is just done in the middle. When the salmon is done, drizzle with balsamic lime glaze and enjoy! **A little sweetness – Depending on how tart your lime juice is and how strong your vinegar is, you may find that you’d like a little more honey. Taste the glaze when it’s thickened and add additional honey as needed. Similarly, you may find you’d like a little more salt or pepper. Garnish – To garnish this, you can sprinkle it with a little fresh lime zest (it’s easiest to zest your limes before juicing them) or some fresh cilantro. Seriously so amazing! I had some frozen salmon in the freezer and whipped this up for a quick meal. I’ll make it again and again! Thank you! Oh my goodness this was DELISH!!! Thank you for such a simple, flavorful recipe!! Oh, YAY! I’m SO glad you enjoyed it! the sauce is amazing. so good! i omitted the salt cause I’m on a low sodium lifestyle due to medical issues. i used penzey’s sunny spain salt free and everything was good. Ooh! That blend sounds amazing! I need to track it down! Recipe turned out perfect! Although added a splash of OJ to the glaze and cooked salmon longer with glaze drizzled on top.